A lot of people are asking, What would Jesus do? What if we know what he would do, but we just can’t seem to do it? This book helps us see that it really is possible to change – the journey of transformation toward Christlikeness is not impossible but actually quite realistic. The key is connecting with God, which helps us live an eternal kind of life here and now. Such connecting not only changes us but brings us that oneness with God described in Scripture. Without it, we are only half-alive. After an introductory chapter on spiritual formation, each chapter helps you enter into the life of Jesus – not just what he said, but what he was like – and explore a certain quality that we have missed or lost sight of and what it looks like to live like him today. At the end of each chapter are 15-20 simple specific practices (spiritual disciplines) that help a person receive that quality of Jesus into themselves. I believe this book is the finest and most transparent and helpful contemporary book on the imitation of Christ, or more accurately, on participation in Christ’s compassionate heart. 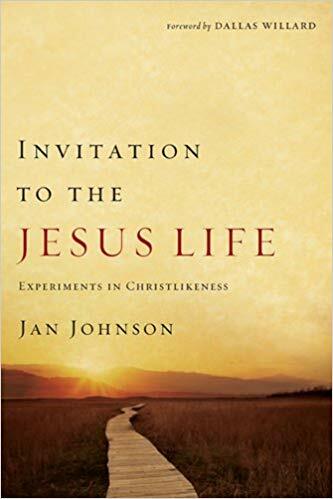 Your book Invitation to the Jesus Life has been of great value to me in overcoming my struggle with fear and anxiety. I have read your chapter on fear over and over and used many of the exercises suggested at the end. To use the Book as a Group Bible Study, see page 239 for instructions. *Special note for readers of The Divine Conspiracy: This is my attempt at a curriculum for Christlikeness. Soul School: Will I Ever Change?